My home is now about 8 years old. We built new in the neighborhood of Parkdale northwest. We love it here…it’s close to the river paths for long walks and bike rides. Our master bedroom faces south so we get a lot of sun and a view of the playground across the street. In the spring, the children play t-ball in the park and it’s just a wonderful, quaint and enjoyable sight! 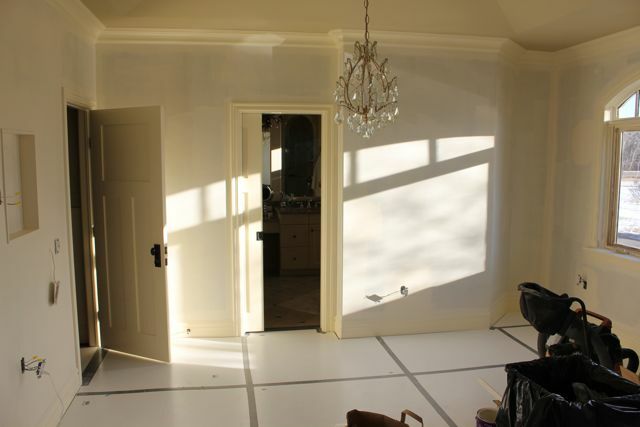 We didn’t do anything special with our bedroom as we were focused on other living areas of the house. Now, after all this time we decided it was time to go all out and make the room of our dreams! A few years ago we stayed at the famous Savoy Hotel in London, England and immediately fell in love with the formal, gorgeous high ceilings, mouldings, luxurious fabrics and small details. Our mission has been to duplicate the luxury hotel feel so that we can relax and enjoy the same “vacation” in our own home. We moved entirely into the guest room so that the mess would not infringe on us. A good idea! Then we didn’t feel pressured to have a deadline. I wish I had taken photos of the “BEFORE” state of our room…but live and learn! Here are the first steps towards that dream!. 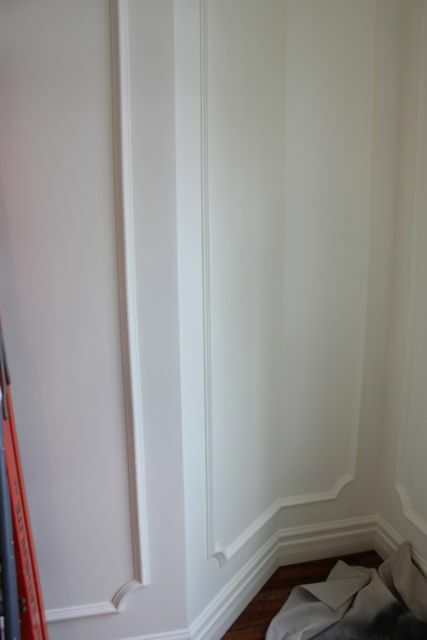 So the beginning involved moving each and every electrical outlet to accommodate the mouldings that we planned to do. That was a huge job in itself! I can’t take credit for any of that! I wasn’t about to be responsible for electrical work! 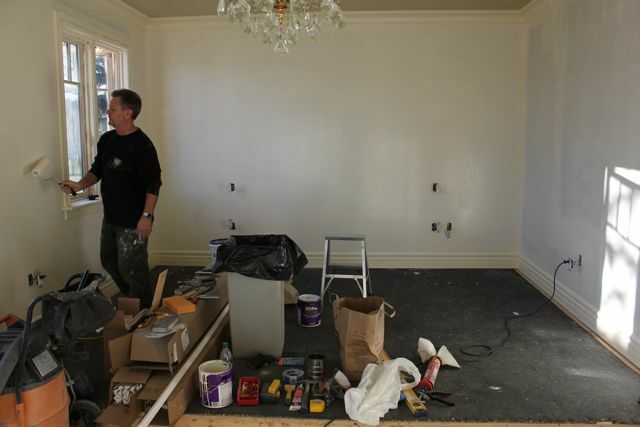 Then we painted out the entire room in primer tinted with halo paint color (Benjamin Moore) which is the color we used on the entire house trims, doors, windows. We decided to keep the theme in the bedroom so that the house wouldn’t be chopped up with different colors and therefore have a seamless transition. 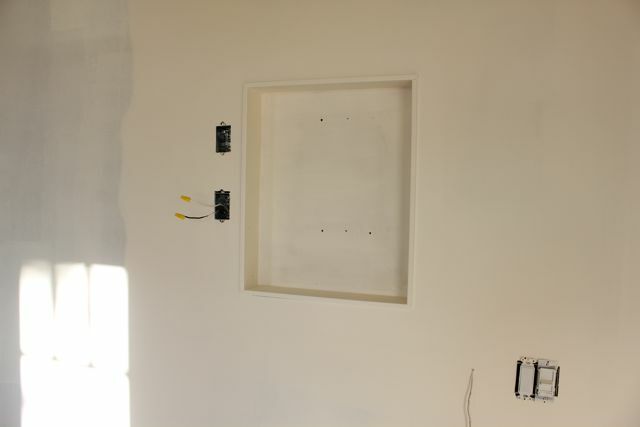 This box was created to accommodate the folding arm of a wall television so that the t.v. would not protrude too much from the wall. We love movies and what better place to be totally relaxed and comfy than in our private retreat! 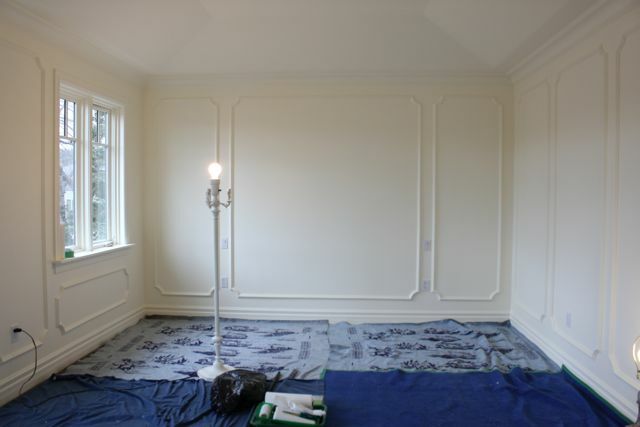 We then carefully planned out the design of the mouldings and where they would be placed on the walls. 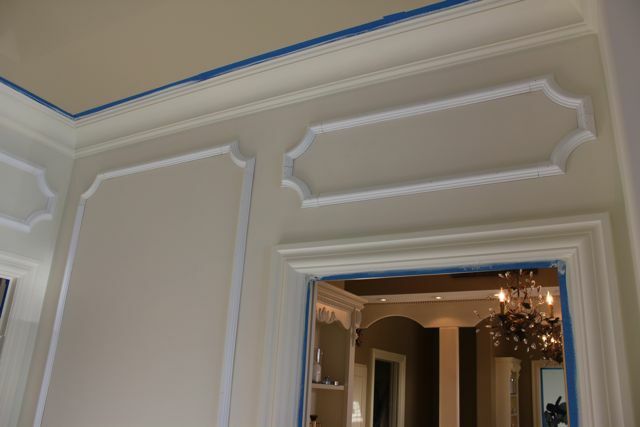 Murray then meticulously cut and installed all the mouldings and filled in the gaps. Starting to come together and create our vision! 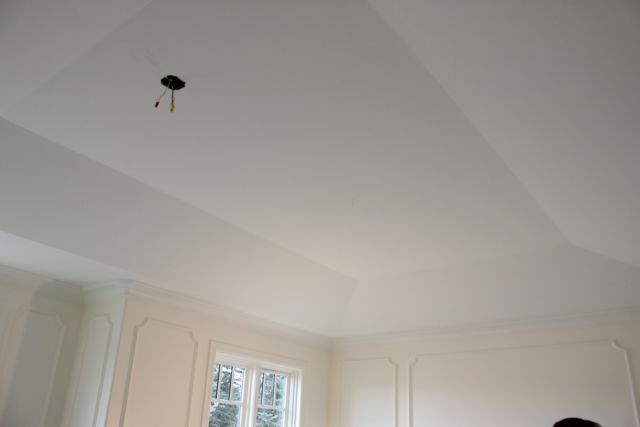 The ceiling was also painted. 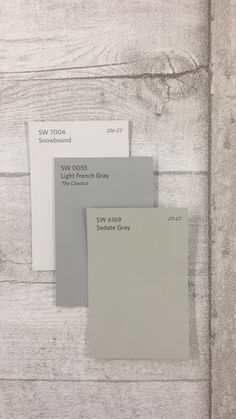 We wanted a clean palette to compliment the furnishings that we are putting in the room. So all was painted in the same color. 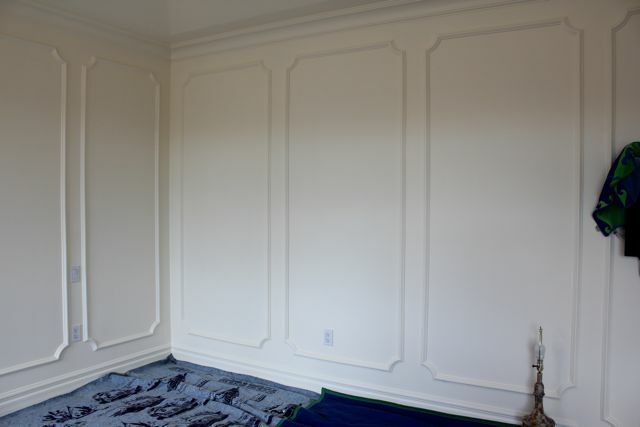 We have a great graduated high ceiling that gives the room a formal feeling. 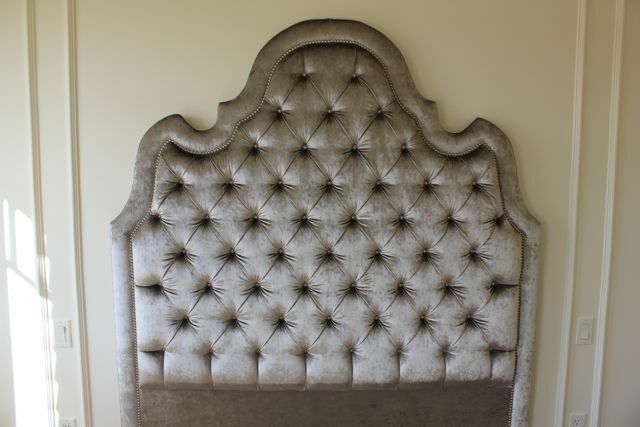 Inspired by a headboard I found on Pinterest, Murray templated the design using the photo and created the wooden frame. He did a phenomenal job. Next, it was taken to the upholstery shop. 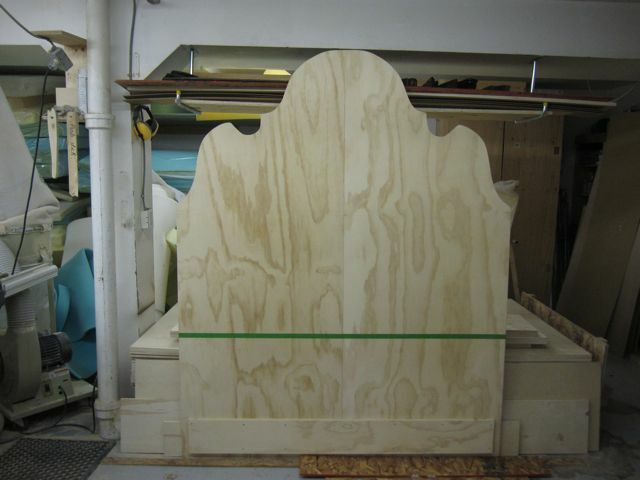 Murray also built the framing for the mattress and boxspring (to be upholstered as well). This saved us a LOT of money! 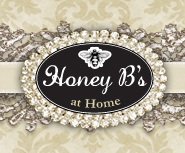 I’m so blessed to have such a talented husband…he has as much fun as I do creating these projects. What can I say? Spectacular! 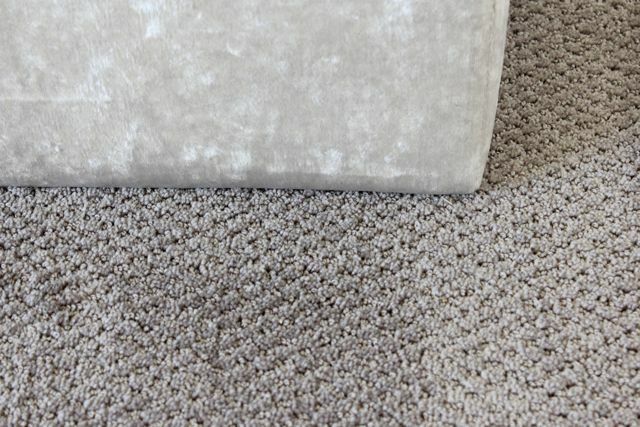 The fabric is a soft taupe/grey crushed velvet with lots of depth and sheen. There are a total of 54 button tufts! 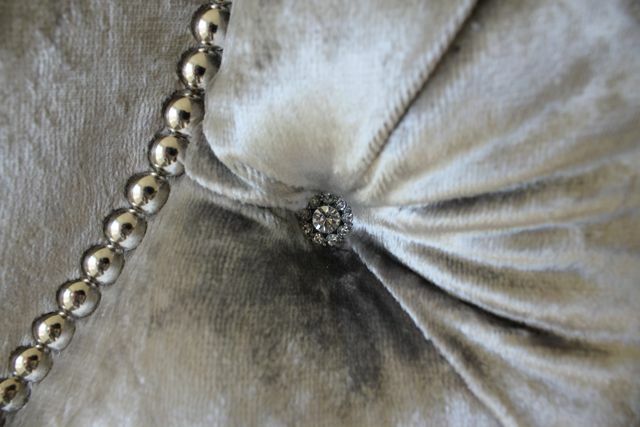 Silver upholstery tacks to compliment the sheen and the crystals. 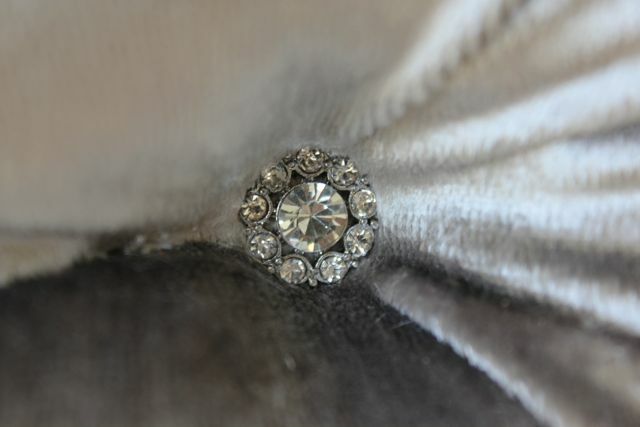 These 5/8″ inch crystal buttons were a challenge for me…nothing in Calgary like this so I searched and searched online until I found the perfect design. Amazingly, they were relatively inexpensive but are real crystal! New carpet installed. 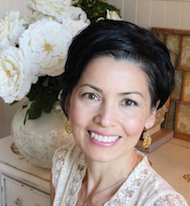 Color called “Sparrow” a soft taupe/grey with flecks of silk to add depth and color. 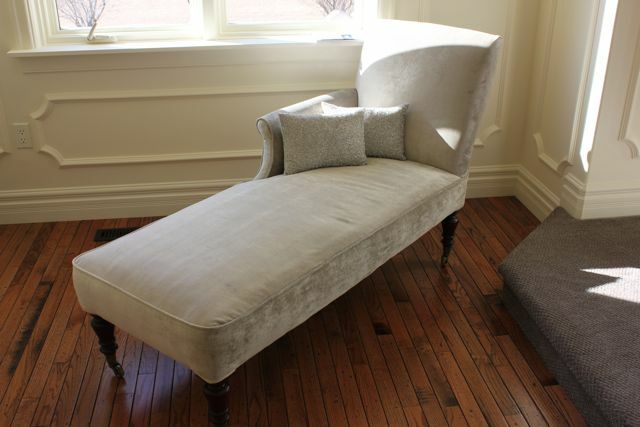 I had this antique chaise for a number of years and at one time was going to sell it! 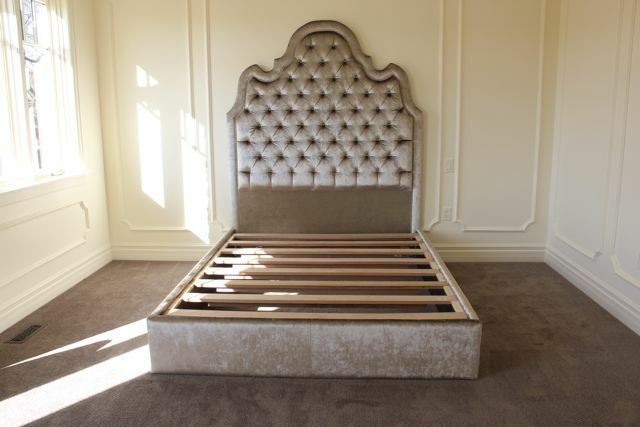 So glad I didn’t…it fits perfect in the bedroom. Now the search is on for a side table for my stack of decorating books! 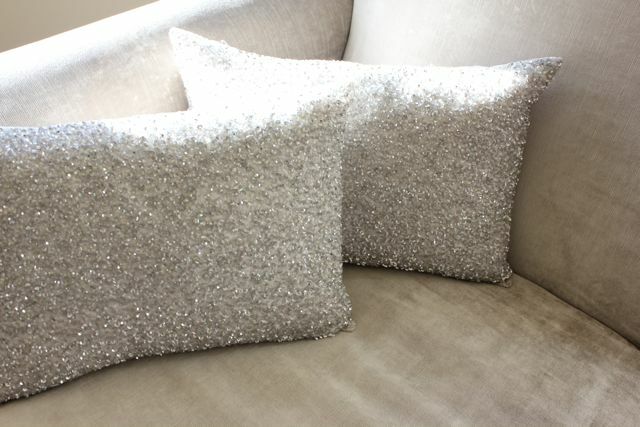 A little bling on these pillows also fits perfect in the theme! So far so great!! 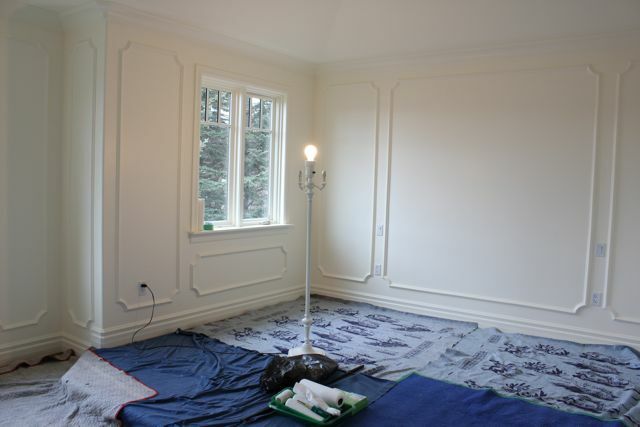 More to come….draperies, bedding and lighting! Will update as it comes along! It is absolutely gorgeous! I adore the headboard and chaise! 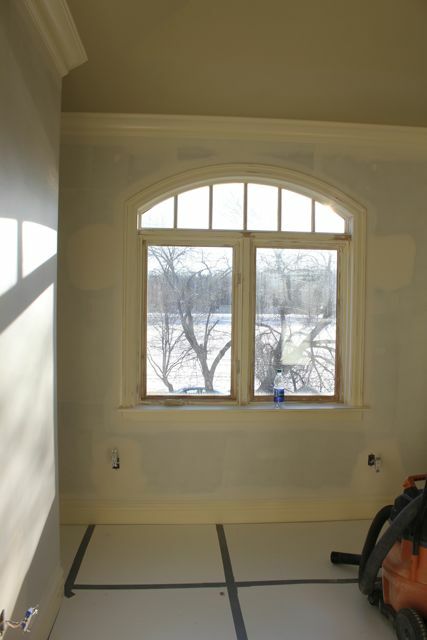 I can hardly wait to see the finished project. I think you have inspired me to start on my house here. What is the color in your living room. thank God I brought all my stuff here nobod has your taste over here in the middle east. Your inspirational. 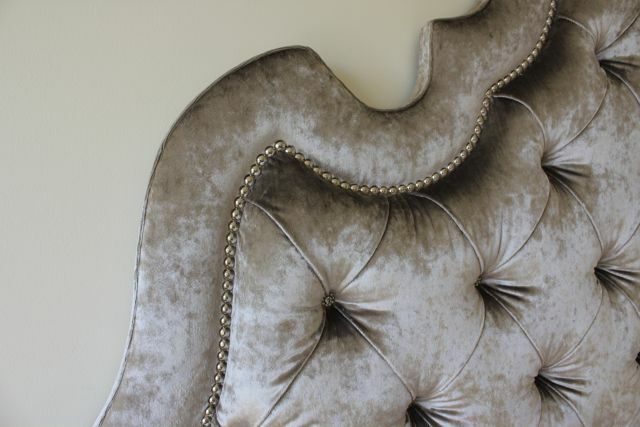 Really beautiful rococo style headboard, reminds me of our giant sofa we have with very oranate and crystal beaded pillows too, but I love how you make it very yours custom fabric and buttons and bed frame etc. So lovely! 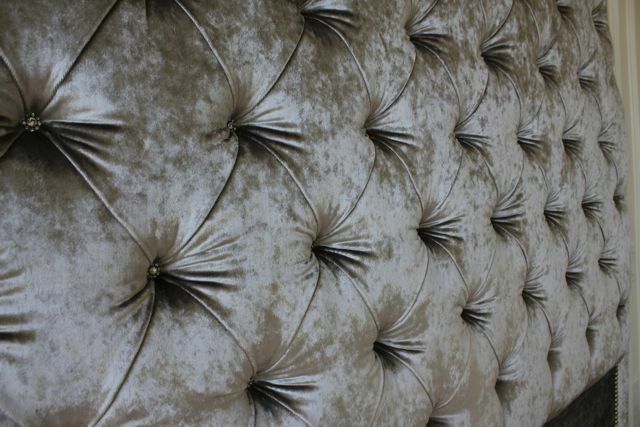 where did you find the buttons, we are transforming a tufted headboard and we have chosen material very similar to yours. we have been searching high and low for the same type of buttons. my email is lsj241@yahoo.com or suejohnston47@hotmail.com……thank you in advance for your help.